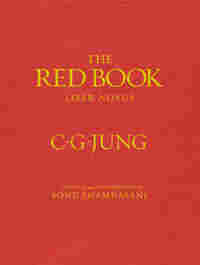 'The Red Book': A Window Into Jung's Dreams The journal,16 years in the making, in which psychoanalyst Carl Jung documented his inner life was long hidden. After a painstaking translation and reproduction, it is finally available to the public. 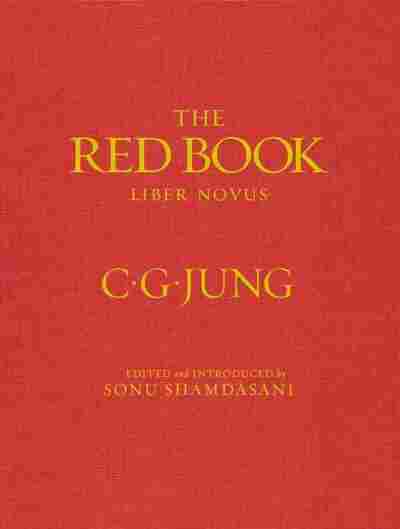 The first words of Carl Gustav Jung's Red Book are "The way of what is to come." What follows is 16 years of the psychoanalyst's dive into the unconscious mind, a challenge to what he considered Sigmund Frued's — his former mentor's — isolated world view. 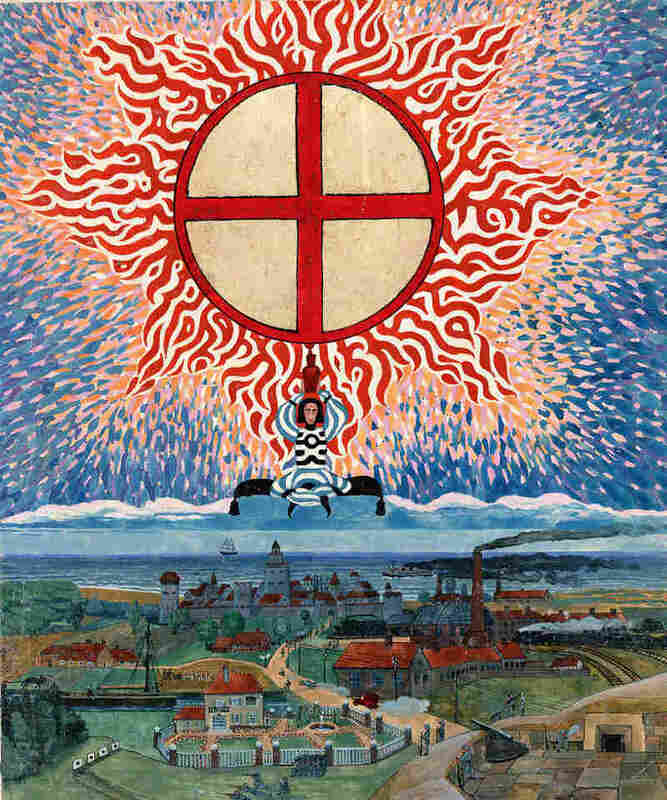 Far from a simple narrative, the Red Book is Jung's voyage of discovery into his deepest self. The voyage began at age 11. "On my way to school," Jung recalled in 1959, "I stepped out of a mist and I knew I am. I am what I am. And then I thought, 'But what have I been before?' And then I found that I had been in a mist, not knowing to differentiate myself from things; I was just one thing among many things." Thirty years later, Jung had a bookbinder make an enormous volume covered in red leather into which he poured his explorations into himself. 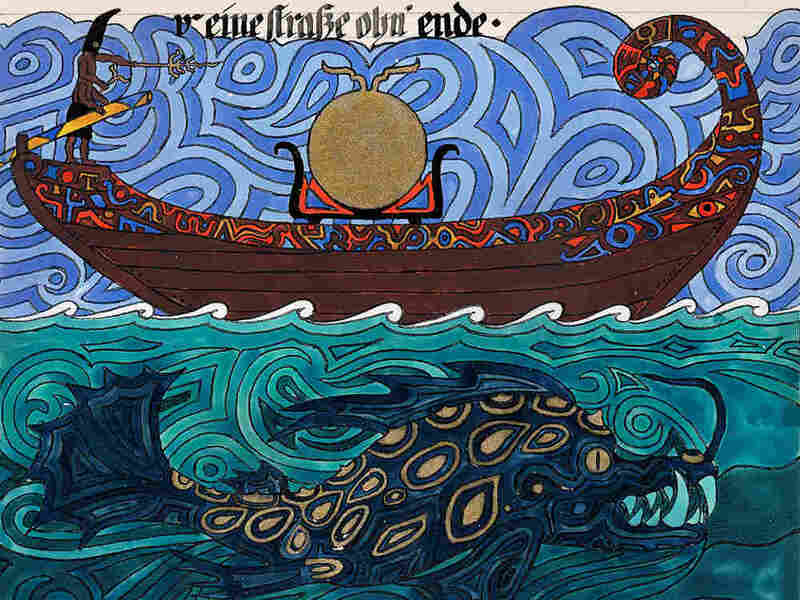 These explorations included some psychedelic drawings of mythical characters of his dreams and waking fantasies — explorations that Jung feared would make people think him mad. It took Jungian scholar Dr. Sonu Shamdasani three years to convince Jung's family to bring the book out of hiding. It took another 13 years to translate it. And still, the Red Book remains incomplete. The last word Jung wrote in the Red Book is "moglichkeit," or possibility. From its hiding place in a Swiss bank vault, the original Red Book is now on display for the first time at the Rubin Museum of Art in Manhattan, and the translation of the massive volume is at book stores for a hefty $200. nolite audire verba prophetarum, qui prophetant vobis et decipiunt vos visionem cordis sui loquuntur, non de ore Domini. audivi quae dixerunt prophetae prophetantes in nomine meo mendacium, atque dicentes: somniavi, somniavi. usquequo istud est in corde prophetarum vaticinantium mendacium et prophetantium seductionem cordis sui? qui volunt facere ut obliviscatur populus meus nominis mei propter somnia eorum, quae narrant unusquisque ad proximum suum: sicut obliti sunt patres eorum nominis mei propter Baal. propheta, qui habet somnium, narret somnium et qui habet sermonem meum, loquatur sermonem meum vere: quid paleis ad triticum? dicit dominus. The door of the Mysterium has closed behind me. I feel that my will is paralyzed and that the spirit of the depths possesses me. I know nothing about a way. I can therefore neither want this nor that, since nothing indicates to me whether I want this or that. I wait, without knowing what I'm waiting for. But already in the following night I felt that I had reached a solid point. I find that I am standing on the highest tower of a castle. The air tells me so: I am far back in time. My gaze wanders widely over solitary countryside, a combination of fields and forests. I am wearing a green garment. A horn hangs from my shoulder. I am the tower guard. I look out into the distance. I see a red point out there. It comes nearer on a winding road, disappearing for a while in forests and reappearing again: it is a horseman in a red coat, the red horseman. He is coming to my castle: he is already riding through the gate. I hear steps on the stairway, the steps creak, he knocks: a strange fear comes over me: there stands the red one, his long shape wholly shrouded in red, even his hair is red. I think: in the end he will turn out to be the devil. The Red One: "I greet you, man on the high tower. I saw you from afar, looking and waiting. Your waiting has called me." T. R.: "Who am I? You think I am the devil. Do not pass judgment. Perhaps you can also talk to me without knowing who I am. What sort of a superstitious fellow are you, that immediately you think of the devil?" I: "If you have no supernatural ability, how could you feel that I stood waiting on my tower, looking out for the unknown and the new? My life in the castle is poor, since I always sit here and no one climbs up to me." T. R.: "So what are you waiting for?" I: "I await all kinds of things, and especially I'm waiting for some of the world's wealth, which we don't see here, to come to me." T. R.: "So, I have come to absolutely the right place. I have wandered a long time through the world, seeking those like you who sit upon a high tower on the lookout for things unseen." I: "You make me curious. You seem to be a rare breed. Your appearance is not ordinary, and then too — forgive me — it seems to me that you bring with you a strange air, something worldly, something impudent, or exuberant, or — in fact — something pagan." T. R.: "You don't offend me, on the contrary, you hit your nail on the head. But I'm no old pagan as you seem to think." I: "I don't want to insist on that. You are also not pompous and Latin enough. You have nothing classical about you. You seem to be a son of our time, but as I must remark, a rather unusual one. You're no real pagan, but the kind of pagan who runs alongside our Christian religion." T. R.: "You're truly a good diviner of riddles. You're doing better than many others who have totally mistaken me." I: "You sound cool and sneering. Have you never broken your heart over the holiest mysteries of our Christian religion?" T. R.: "You're an unbelievably ponderous and serious person. Are you always so urgent?" I: "I would — before God — always like to be as serious and true to myself as I try to be. However, that certainly becomes difficult in your presence. You bring a certain gallows air with you, and you're bound to be from the black school of Salerno, where pernicious arts are taught by pagans and the descendants of pagans." T. R.: "You're superstitious and too German. You take literally what the scriptures say, otherwise you could not judge me so hard." I: "A hard judgment is the last thing I would want. But my nose does not play tricks on me. You're evasive, and don't want to reveal yourself. What are you hiding?" T. R.: "I hide nothing from you, you true-hearted soul. I simply amuse myself with your weighty seriousness and your comic veracity. This is so rare in our time, especially in men who have understanding at their disposal." I: "I believe you cannot fully understand me. You apparently compare me with those whom you know. But I must say to you for the sake of truth that I neither really belong to this time nor to this place. A spell has banished me to this place and time for years. I am really not what you see before you." T. R.: "You say astounding things. Who are you then?" I: "That is irrelevant. I stand before you as that which I presently am. Why am I here and am like this, I do not know. But I do know that I must be here to justify myself according to my best knowledge. I know just as little who you are, as you know who I am." T. R.: "That sounds very strange. Are you something of a saint? Hardly a philosopher, since you have no aptitude for scholarly language. But a saint? Surely that. Your solemnity smells of fanaticism. You have an ethical air and a simplicity that smacks of stale bread and water." I: "I can say neither yes nor no: you speak as one trapped in the spirit of this time. It seems to me that you lack the terms of comparison." T. R.: "Perhaps you attended the school of the pagans? You answer like a sophist. How can you then measure me with the yardstick of the Christian religion, if you are no saint?" I: "It seems to me, though, that one can apply this yardstick even if one is no saint. I believe I have learned that no one is allowed to avoid the mysteries of the Christian religion unpunished. I repeat: he whose heart has not been broken over the Lord Jesus Christ drags a pagan around in himself, who holds him back from the best." T. R.: "Again this old tune? What for, if you are not a Christian saint? Are you not a damned sophist after all?" I: "You are ensnared in your own world. But you certainly seem to think that one can assess the worth of Christianity correctly without being a downright saint." T. R.: "Are you a doctor of theology, who examines Christianity from the outside and appreciates it historically, and therefore a sophist after all?" I: "You're stubborn. What I mean is that it's hardly a coincidence that the whole world has become Christian. I also believe that it was the task of Western man to carry Christ in his heart and to grow with his suffering, death, and resurrection." T. R.: "Well, there are also Jews who are good people and yet had no need for your solemn gospels." I: "You are, it seems to me, no good reader of people: have you never noticed that the Jew himself lacks something — one in his head, another in his heart, and he himself feels that he lacks something?" T. R.: "Indeed I'm no Jew, but I must come to the Jew's defense: you seem to be a Jew hater." I: "Well, now you speak like all those Jews who accuse anyone of Jew hating who does not have a completely favorable judgment, while they themselves make the bloodiest jokes about their own kind. Since the Jews only too clearly feel that particular lack and yet do not want to admit it, they are extremely sensitive to criticism. Do you believe that Christianity left no mark on the souls of men? And do you believe that one who has not experienced this most intimately can still partake of its fruit?" T. R.: "You argue your case well. But your solemnity?! You could make matters much easier for yourself. If you're no saint, I really don't see why you have to be so solemn. You wholly spoil the fun. What the devil is troubling you? Only Christianity with its mournful escape from the world can make people so ponderous and sullen." I: "I think there are still other things that bespeak seriousness." The Red One: "Oh, I know, you mean life. I know this phrase. I too live and don't let my hair turn white over it. Life doesn't require any seriousness. On the contrary, it's better to dance through life." I: I know how to dance. Yes, would we could do it by dancing! Dancing goes with the mating season. I know that there are those who are always in heat, and those who also want to dance for their Gods. Some are ridiculous and others enact Antiquity, instead of honestly admitting their utter incapacity for such expression." The Red One: "Here, my dear fellow, I doff my mask. Now I grow somewhat more serious, since this concerns my own province. It's conceivable that there is some third thing for which dancing would be the symbol." The red of the rider transforms itself into a tender reddish flesh color. And behold — Oh miracle — my green garments everywhere burst into leaf. I: "Perhaps too there is a joy before God that one can call dancing. But I haven't yet found this joy. I look out for things that are yet to come. Things came, but joy was not among them." T. R.: "Don't you recognize me, brother, I am joy!" I: "Could you be joy? I see you as through a cloud. Your image fades. Let me take your hand, beloved, who are you, who are you?" Reprinted from The Red Book by C. G. Jung. Images copyright 2009 by Foundation of the Works of C. G. Jung. Translation copyright 2009 by Mark Kyburz, John Peck, and Sonu Shamdasani. With permission of the publisher, W.W. Norton & Company, Inc.